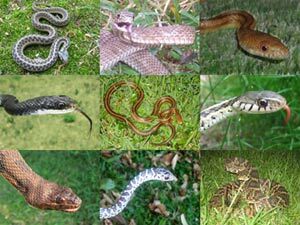 Below is an analysis of some of the popular methods of capturing and removing snakes. Always handle snakes carefully, don't kill snakes, and remember, knowledge helps a great deal in avoiding snake troubles, and in ensuring successful snake capture. SNAKE HOOK The snake hook is one of the best tools to use to catch larger, thicker snakes that cannot be handled by hand, such as this venomous Cottonmouth to the left. The snake is not impaled on the hook of course, but scooped up around the belly and lifted. Once the snake is draped on the hook, it has no leverage, nothing to push against, and can't move very well. With some effort, snakes can move on the hook, and if they snake is not balanced, such as if the snake is held near either the head or tail, it will slip off. The hook can be used to sweep the ground and debris. It is easiest to use on fat, slow snakes, and hard to use on thin, fast, snakes. It'd be pointless to even try a snake hook in the removal of a small snake - it would just slide right off the hook. Snake hooks are best used by professional snake handlers, especially for the capture and transportation of large venomous species. SNAKE TONGS Snake tongs are composed of a gripping handle attached to an internal cable, which in turn operates a clamp on the business end. Snake tongs are basically big graspers. There are various models of snake tong. I prefer the Gentle Giant by tongs.com, which has a very broad head, coated in rubber. 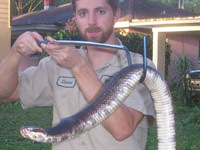 The broad head prevents injury to a snake, and the rubber coating provides a better grip. Tongs are best used on thinner snakes. They won't fit around a fat snake, but they will tightly hold on to a thinner, faster snake, which might otherwise slip off a snake hook. The disadvantage with tongs is that it can be harder to grasp the snake than with a hook. A hook can just scoop the snake up. The tongs have to go around the snake and then close - this takes aim and speed and a lack of surrounding debris. Many attempts to grab a snake with tongs fail. I put most captured snakes into a snake sack, such as the one seen to the left. This is a good way to transport a snake. 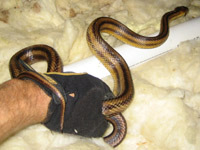 GRABBING BY HAND Here is a photo of me grabbing a Yellow Rat Snake up in an attic. 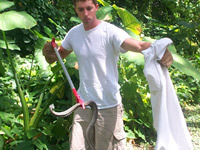 Grabbing snakes by hand is the surest way to get a nearby snake in your possession. The only problem is that you are exposed to a bite. If you don't grab the snake correctly, it can swing right around and bite your hand or arm. Only extremely experienced professionals should ever attempt to capture a venomous snake by hand. I don't take the risk, personally. In the photo to the left, I know that I'm dealing with a harmless and docile snake. If I grab it gently, it won't even try to bite. If it does, I can drop it or be exposed to a relatively minor injury from small teeth. I only grab non-venomous snakes, and I do so when I see a snake that I need to remove, because it's the surest way to get it. Rather than mess around with inaccurate tongs, I just lunge and grab it. I sometimes lightly pin it to the ground first. If bites are a concern, I hold it near the head. See more Florida snake photos. SNAKE TRAP Most of my snake removals are from traps. 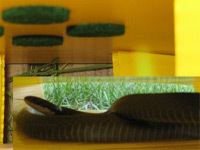 Traps are safe and easy ways to catch unwanted snakes. They are very effective, because they work 24/7. If a homeowner calls me about a snake in the yard or the basement, I have to drive to the home, often after other wildlife jobs, and by the time I get there, the snake has hidden. Snakes can be very hard to find. If I can't find it within 30-45 minutes, I set a snake trap. By the next day or so, I'll have caught it. Also, there's some cases in which snakes infest an area, like a school or a hotel or a theme park, etc. I set several snake traps on the property and check them every day, and remove all the snakes caught. All I have to do is pick up the trap with the snake safely ensnared inside, and that's it. I drive the snake to a far away relocation spot, spray a little cooking oil on it, and it works itself free. After it slithers off, I take back my trap to use again. Click the button below if you want to order a professinal snake trap.